Katsushika Hokusai (1760–1849) was the first Japanese artist to be internationally recognized, and his art continues to inspire the imaginations of viewers two centuries later. Drawing from its preeminent Japanese collection, the Museum of Fine Arts, Boston (MFA), presents Hokusai from April 5 through August 9, 2015. Home of the finest Hokusai collection in the world, the MFA is uniquely positioned to offer a comprehensive exhibition of this remarkable artist. 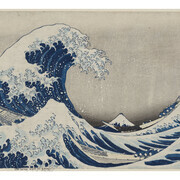 Showcasing more than 230 works from Hokusai’s seven-decade career, the exhibition features some of the most iconic images in art history, including an early edition of the color woodblock print Under the Wave Off Kanagawa (The Great Wave) (about 1830–31)—a work frequently referenced in pop culture, from tattoos to emoji. The Great Wave is part of the legendary series Thirty-six Views of Mount Fuji. 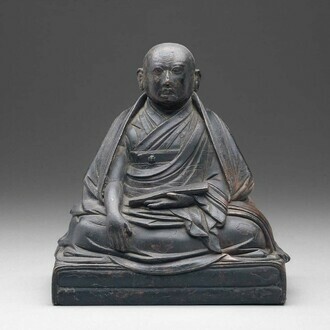 This exhibition marks the first time the MFA has displayed 36 views together. Also on view is the unique and brilliantly colored multi-panel screen painting, Phoenix (1835), which measures almost eight feet long. Spanning Hokusai’s work from his 20s through his 80s, the exhibition explores common themes through sections dedicated to topics such as landscapes, nature and the “Floating World” of urban culture (including depictions of the Kabuki theater and the Yoshiwara pleasure district). Works that depict Japanese historical and literary motifs are featured along with “perspective prints” with exaggerated vanishing points for use in toy peep shows. An extremely delicate silk square of a mythological Chinese lion, likely used as a gift wrapper (fukusa), is also included in a rare public display of the work. Hokusai builds upon an extremely popular traveling exhibition organized by the MFA in 2014, also called Hokusai, which toured Japan and drew over 500,000 visitors in Nagoya, Kobe, Kitakyushu and Tokyo. Media sponsor is WCVB Channel 5 Boston. 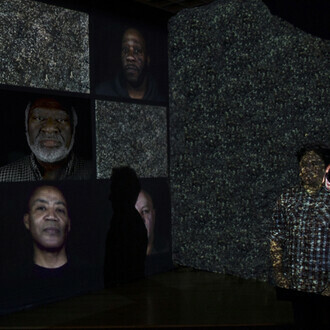 With generous support from the Jean S. and Frederic A. Sharf Exhibition Fund. 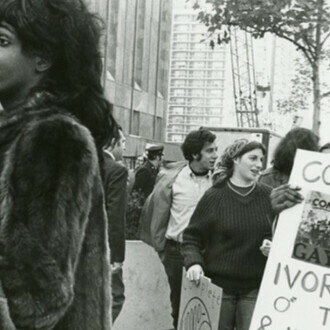 Additional support provided by The Mary-Louise Eddy and Ruth N. Eddy Foundation. Support for conservation provided by Nikkei, Inc. 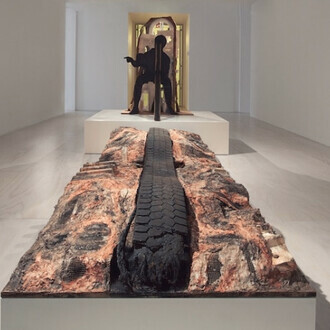 The exhibition is organized into seven themes, including Urban Pleasures; Views of Mount Fuji; Waterfalls and Bridges; Ingenious Designs; Private Commissions; Nature Studies; and Legend and Literature. 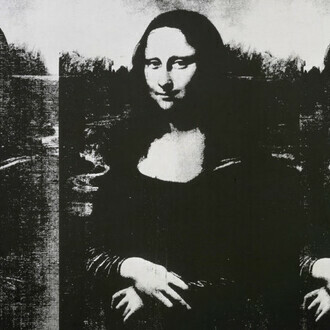 In addition to his most famous works, also featured are lesser-known pieces depicting whimsical instructions on how to draw, dynamic paintings on paper lanterns and elaborate cut-out dioramas. A section exploring blockcarving technique includes a set of woodblocks and reproduction prints that outline the step-by-step process used to make The Great Wave, as well as two videos showing the process of carving and printing woodblocks. Every Saturday, a Japanese Woodblock Print Artist Toolbox Cart outside the exhibition allows visitors to view and handle the tools used to create the unique art form, learning from knowledgeable staff during this free, drop-in program. An accompanying publication by exhibition curator Sarah Thompson, the MFA’s Assistant Curator for Japanese Prints, presents the wide range of Hokusai’s artistic production in terms of one of his most remarkable characteristics: his intellectual ingenuity. “What I love about Hokusai is his unbeatable combination of skill, versatility and wit—he does so many different things, and he does them all so well and so cleverly. 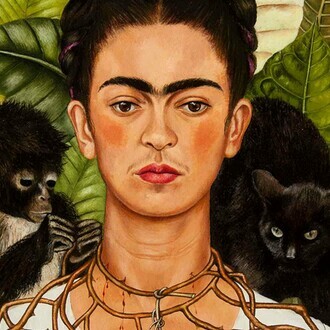 His work has something for everyone, and lots of wonderful surprises,” said Thompson. Hokusai was trained in the school of art known as ukiyo-e, or “pictures of the Floating World,” which drew its subject matter from fashionable city life, especially the kabuki theater and the Yoshiwara pleasure quarter. 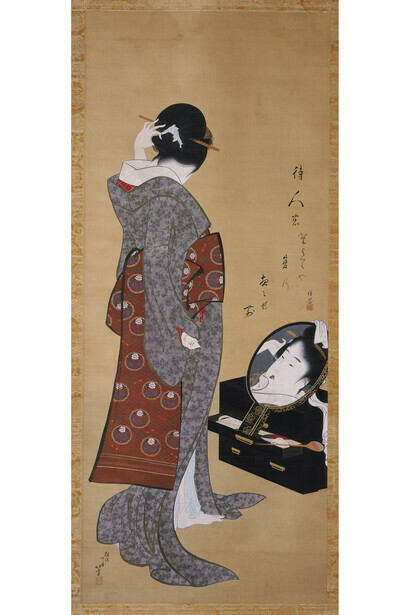 From his teacher, Katsukawa Shunshō, he learned not only how to design woodblock prints of actors and courtesans, but how to create elegant, expensive paintings using fine materials and sophisticated techniques. 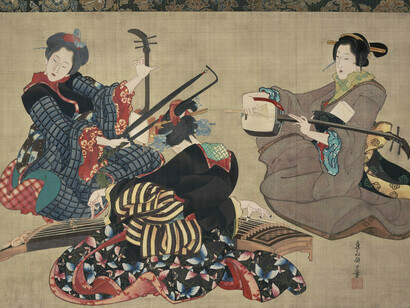 Highlights of the “Urban Pleasures” section of the exhibition include the paintings Woman Looking at Herself in a Mirror (about 1805) by Hokusai himself and Three Women Playing Music (1818–44) by his talented daughter Katsushika Ōi, to whom he passed on his mastery of ukiyo-e painting techniques. Hokusai was interested in the styles of other schools of art as well, and as a young man he designed prints using an exaggerated form of Western-style vanishing-point perspective—a key element in his later landscape prints. The exhibition includes a number of these unusual works, including a complete set of 11 perspective prints based on the kabuki play Chūshingura, in almost-new condition. In 1830, at the age of 70, Hokusai began the project that would eventually make him famous around the world: the woodblock print series Thirty-six Views of Mount Fuji (about 1830–31). Landscape had previously been a minor subject in the repertoire of ukiyo-e artists, but the success of this bestselling series made it a major theme. Hokusai shows the sacred mountain from many different angles, at different seasons and times of day, focusing sometimes on the landscape itself and sometimes on human activities. 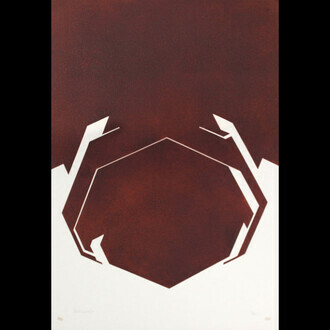 The series was so popular that he designed 10 more prints shortly after the first set was issued, for a total of 46. The two most famous designs in the series are known by their nicknames: “The Great Wave” (Under the Wave off Kanagawa) and “Red Fuji” (Fine Wind, Clear Weather). The “Views of Mount Fuji” section of the exhibition also includes a contemporary wood bench that incorporates the imagery of The Great Wave. 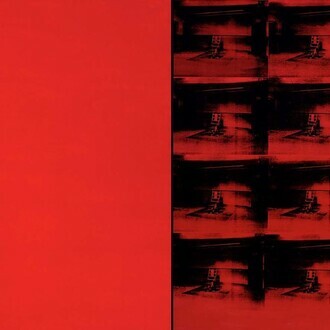 Created by studio-furniture maker John Cederquist, Couchabunga (1992) shows how the print continues to inspire designers, artists and popular culture. Following the enormous success of the Fuji series, Hokusai created more fine landscape designs on other themes. 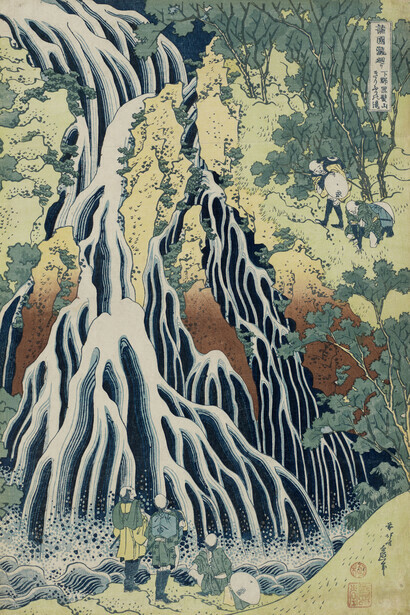 A highlight of the exhibition is a complete set of eight prints from the series A Tour of Waterfalls in Various Provinces (about 1832), Hokusai’s only landscape series in the vertical format. 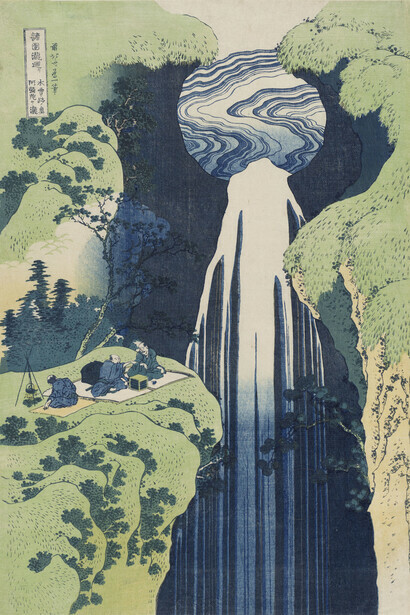 Each print in the series depicts the falling water in a different style, using the same blue outlines as the early Fuji prints. Also included in this section are all three prints of the Snow, Moon, and Flowers series (about 1833), as well as selections from the Remarkable Views of Bridges in Various Provinces (about 1834). 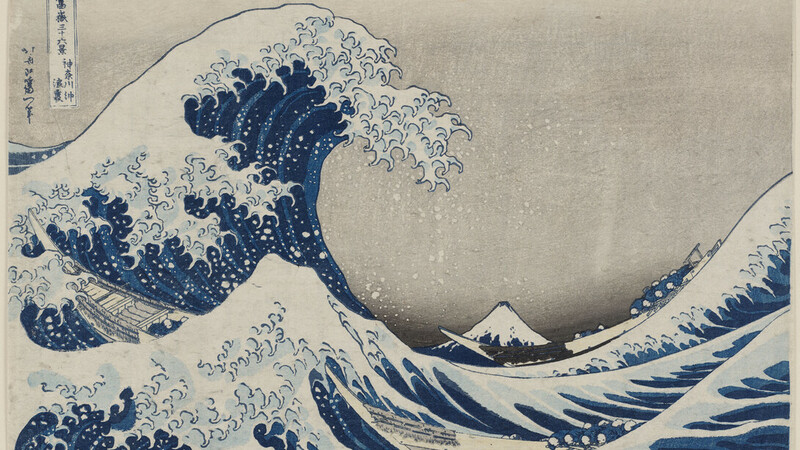 Hokusai was an extremely versatile artist whose talents extended in many unusual directions. 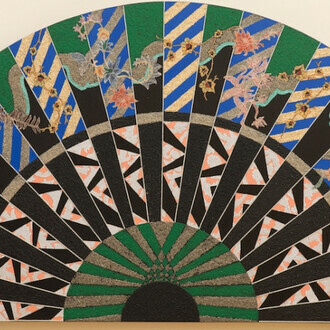 Especially appealing are his cutout dioramas––paper toys for children in which Hokusai turned two-dimensional sheets of paper into three-dimensional scenes. A modest ink sketch of Bodhidharma, the founder of the Zen sect of Buddhism, is actually the record of a remarkable piece of performance art: a gigantic painting completed before a large audience in a single day in 1804. 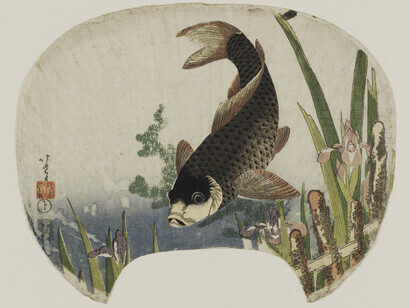 A color print depicting a carp swimming through waterweeds, once pasted to a bamboo framework to make a fan, is the only known surviving impression of this design. 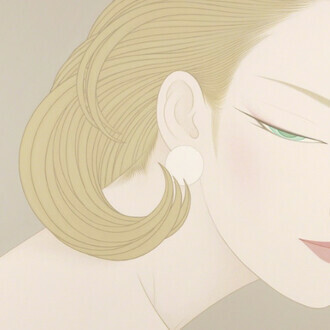 Imaginary portraits of classical poets have the letters of their names concealed in their costumes; and a tall, narrow spray of cherry blossoms is an advertisement for cosmetic powder. From the 1790s through the early 1830s, Hokusai was one of the leading designers of surimono––privately commissioned prints known for the high technical quality of their printing, which could be as lavish as the customer could afford. 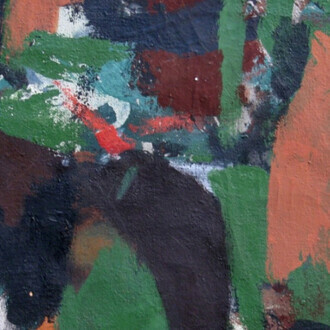 Special features such as embossing and metallic pigments were often used for surimono. The clients who commissioned them were usually the affluent members of amateur poetry clubs, who exchanged prints of illustrated poems at their parties. 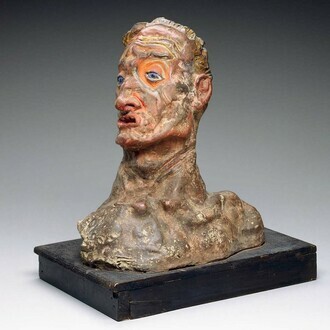 Other examples of privately commissioned prints on view in the exhibition are illustrated programs for musical concerts or comedy performances, and illustrated printed books and hanging-scroll paintings. 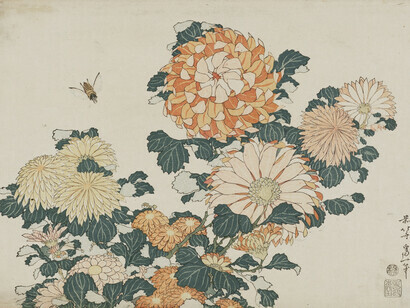 Just as the series Thirty-six Views of Mount Fuji made landscape an important genre of ukiyo-e prints, the untitled series known as Large Flowers (about 1833-34) did the same for nature studies, known in the East Asian tradition as “bird-and-flower pictures.” Hokusai drew on a centuries-old tradition of painting to create vibrant full-color designs for mass-produced prints. Compositions based on underlying geometric shapes give the floral prints the same powerful impact as the landscapes. The exhibition includes nine prints from the Large Flowers series and nine from the even more colorful Small Flowers (about 1834) series. Throughout his long career, Hokusai also drew freely on the rich traditions of Japanese literature, mythology and folklore, depicting fabulous beasts, legendary warriors and eerie ghosts. The final section of the exhibition includes the magnificent Phoenix screen; a pair of painted festival lanterns showing a dragon and tiger, and a dragon and snake; and a complete set of five prints of Ghost Stories (about 1831-32). Also on view is a selection of prints from his final, uncompleted landscape series, The One Hundred Poems Explained by the Nurse (about 1835-36), which illustrates classical poetry with scenes of daily life during Hokusai’s own time.